I have seen the following attributed to Ritsema and van Heist but have not found it in any of their papers. People with no sense of verbal aesthetics have named the red things LLSVP’s for Large Low Shear Velocity Provinces. Sometimes they are called LLVSP’s, but if either of these acronyms were a glass of wine, I would pour it out. Clearly, those things are Pillsbury Doughboys, and will be referred to as doughboys henceforth. The doughboys are low velocity because they are warmer, less physically dense, or both. This aspect is controversial and though they are visible by both S and P earthquake waves the signs are inverted and this is unusual. The dots on the surface are presumed plumes, kimberlite (diamond forming) pipes, or Large Igneous Provinces. It has been observed that much of this activity can be mapped above the 1% attenuation plane which would be an imaginary line drawn about a quarter inch up from the bases of the doughboys. This is very interesting, but it makes no sense because we cannot see anything rising up from this plane which is very low in the mantle. 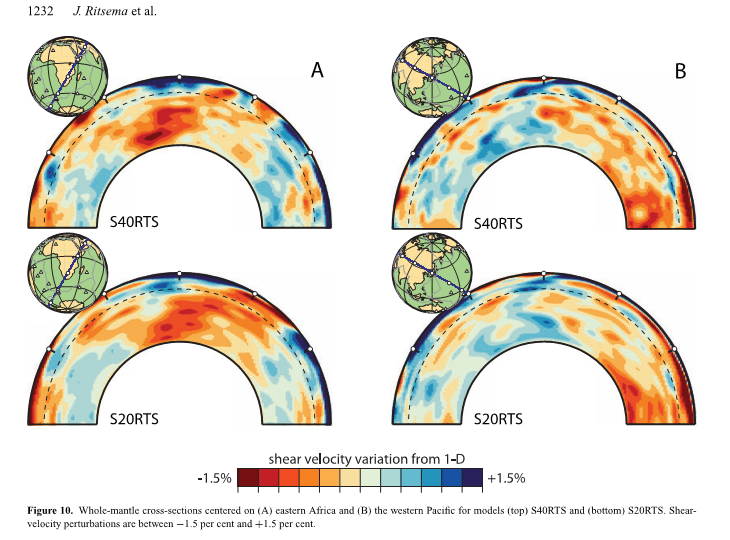 This correspondence with the 1% contour is touted as evidence the doughboys are very old, and it is certainly reasonable to suspect that they are, but some folks have gone hog wild with computer games moving them all around for the last three billion years and postulating plumes and slab return paths we don’t even have evidence for today. 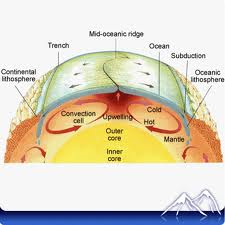 It is important to consider that these doughboys seem to have little relationship to the configuration of ocean spreading ridges, and these ridges, like the Hawaiian hotspot, seem to be shallow pools of molten rock somehow maintaining themselves without deep mantle support. One need only compare our conceptions of the mantle and ocean ridges not so long ago to realize that these innocent doughboys have an attitude when it comes to our cherished preconceptions. It is also very strange that Africa is sitting right on top of a doughboy. Africa is considered the keystone of Pangaea, having moved very little during the breakup. If the doughboy is indeed old, this would mean that Africa has been perched on its doughboy for a quarter of a billion years. This entry was posted in Africa Keystone of Pangea, Asthenia, Geoid, Geology, Large Igneous Provinces, LLSVP, LLSVP's are Doughboys, Moho, Seismic Tomography and tagged LLSVP, P waves, S waves. Bookmark the permalink.